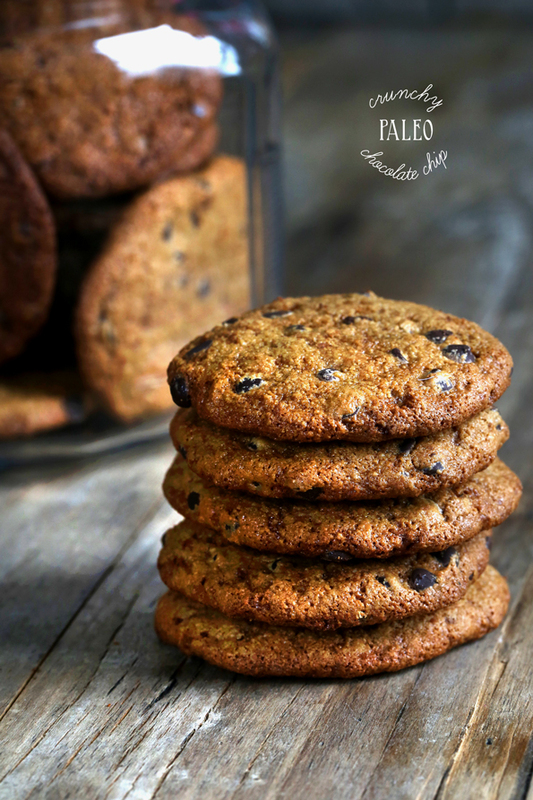 Crunchy Paleo Chocolate Chip Cookies | Great gluten free recipes for every occasion. I can eat any kind of gluten free cookie, and so can my gluten free son. I don’t have to eat Paleo, and I don’t even eat mostly Paleo. But ever since I started messing around with Paleo-style recipes about a year ago (remember my Wheat Belly bread review?) I have been positively dogged by the idea of two things: (1) good Paleo bread, and (2) crunchy Paleo chocolate chip cookies. Not crunchy on the outside, soft on the inside. That’s pretty easy. I’m talking about crispy, crunchy cookies that you can crush to make a no-bake pie crust or just nibble on in bed and leave behind some crumbs. You know the type. Now I’m sure you’ll notice that there are starches in this recipe. Both arrowroot and tapioca starches are Paleo-approved. But yes, they are starches. 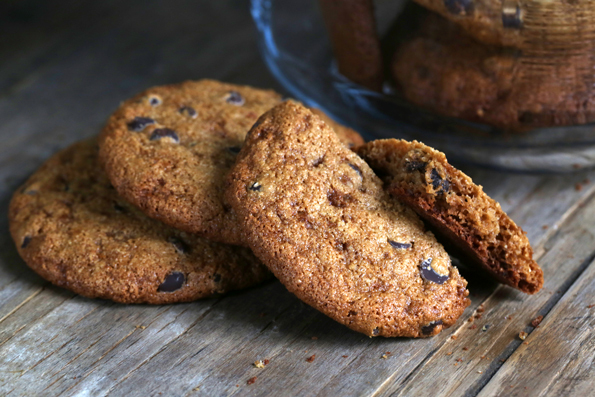 These cookies are a treat, not dinner (well, unless you decide that they should be since you’re a grown up, right?). 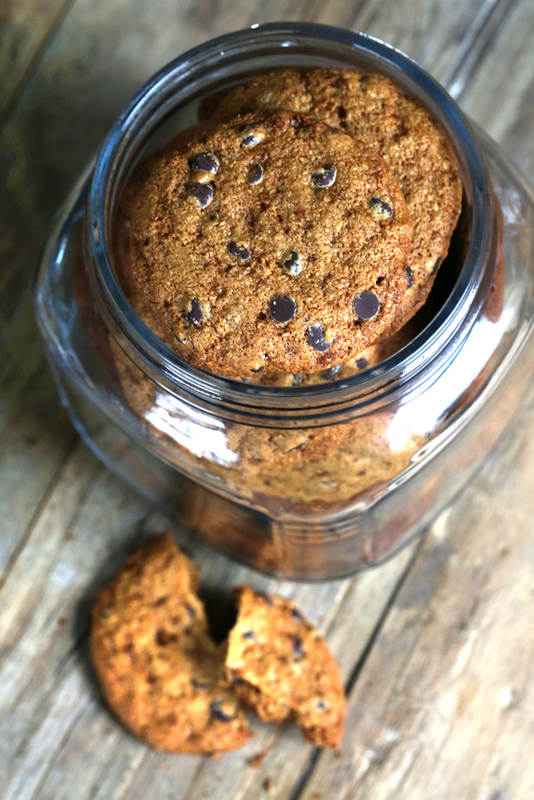 And believe me I tried, but you’re just not going to get a crispy, crunchy Paleo chocolate chip cookie without some starch. I used a blend of arrowroot and tapioca starches and I think it works best. But if you don’t have both and want to use all of one or all of the other, give it a shot and let us know how it goes! 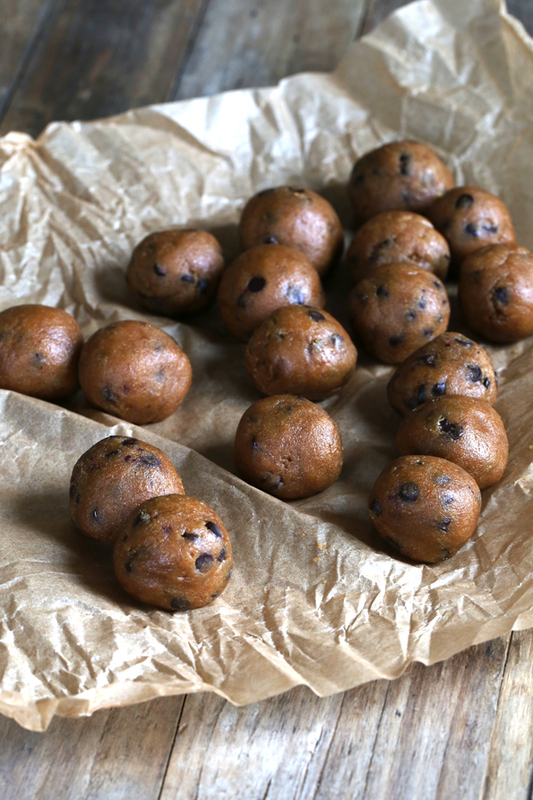 Once you get over the idea of using some starch (and let’s be real – if you’re using sugar, even in the form of coconut sugar, you’re not talking about totally guilt-less health food), you’re going to love these crispy little darlings. The dough is super easy to make (just a bowl and a spoon, thankyouverymuch), but please be sure to chill it before you bake it or you’ll be dealing with some flat cookies. See the crumbs? That’s what happens when you have juuuuust the right blend of flours (and everything is balanced, too, of course) and you bake low (300°F) and slow (about 18 minutes in the oven). These are cookie jar cookies. My favorite! *NOTE: Arrowroot and tapioca starches have different properties, and I found that a blend of these two worked best in these cookies. If you don’t have both, and would like to use all of one or all of the other, give it a shot and let us know how it goes! In a large bowl, place the almond flour, tapioca starch, arrowroot starch, coconut flour, salt, baking soda and finely ground coconut sugar, and whisk to combine well. Remove 1 tablespoon of the blended dry ingredients, place in a small bowl and toss with the chocolate chips. Set the chips aside. Create a well in the center of the dry ingredients, add the coconut oil and eggs and mix to combine. The dough will be thick and soft. Add the chips and reserved dry ingredients, and mix to evenly distribute the chips throughout the cookie dough. Roll the dough tightly into balls about 1-inch in diameter and flatten each into a disk. Place the dough in the freezer until chilled. 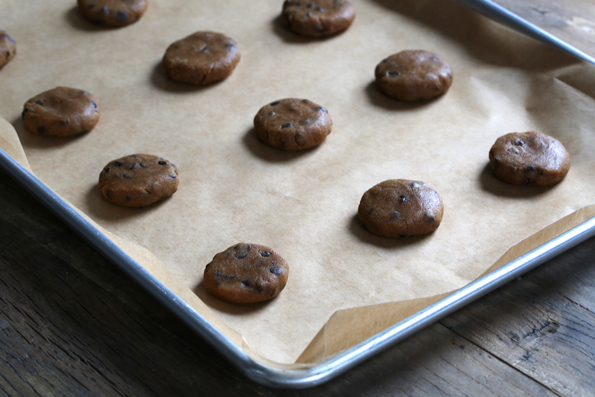 Once the dough has chilled, place the disks of dough on the prepared baking sheets about 2 inches apart (they will spread to about double their size during baking). Place in the center of the preheated oven and bake for about 18 minutes, or until lightly golden brown all over and dry to the touch. Remove from the oven and allow to cool on the baking sheets until firm (about 5 minutes). P.S. Don’t forget your copy of Gluten Free on a Shoestring Bakes Bread! And if don’t want to do the math to build your bread flour, download my Excel spreadsheet (from my Gluten Free Flour page) and let the computer do it for you! These cookies are delicious! Made them as directed. The dough was sort of sticky but I just made sure to keep my hands damp while rolling them out. My children were in hog heaven. YUM! Used 1 egg (45g) and the remaining 75g in applesauce (baby steps eliminating egg) and they came out delicious! I baked one tray at 18 minutes, and should have left them in a tad longer. The 2nd tray went in for about 22-25 and came out much crispier, but not nearly as dark as yours, Nicole. I’m happy with the results and will definitely add this to the cookie rotation, especially since they don’t have rice flour, which is also on the elimination chopping block! Thanks for a very tasty cookie! What is the best place to get a small quantity of almond flour. 5 lbs seems like a lot for a first try — but I can’t wait to make these cookies and the brownies you posted the other day. That’s a great question, Rachel. The two sources I use for blanched almond flour are Honeyville and nuts.com. Honeyville sells a 5 pound bag for about $8 a pound on amazon.com (and probably the same price on their own website), but they only sell the 5 lb. bag. Nuts.com has nonorganic blanched almond flour for $8 a pound as well, and you can buy just 1 pound, but their shipping rates are terrible. So … it’s your choice! Anyone who leaves crumbs in my bed will be in big, big trouble. So, recipe forthcoming for a Paleo no-bake pie? Chocolate coconut milk mousse or something like that?? ;) You shouldn’t be a tease! I really love that you care enough to post the very best! I have almond meal from Trader Joes. I assume that’s coarser than almond flour. Can I just buzz it in the food processor, or is it actually different somehow? I believe almond flour is from the blanched almonds (skins removed), and for the meal the almond skins are ground up as well making it coarser.